The buzz around Brazil and the World Cup is humming in our ears. The hum will soon grow into a resounding boom as players take the pitches around Brazil to fight for the chance to emerge on top. But until our ears can be filled with on-air commentary and our eyes focused on the field, we’ll have to train our senses on another aspect of the game. To fill that void, there is no shortage of analysis, star-studded commercials, and of course, facts and figures from previous World Cups. The Fédération Internationale de Football Association (FIFA) has been counting down for the past 100 days, releasing tidbits of information to entertain soccer fans as they wait for June 12. We’ve pieced together some of the most interesting facts to help you wait out these last few days until the World Cup starts. All of the facts come from FIFA, and any supplemental information has been noted. The record for the match with the highest attendance was set in Brazil more than 60 years ago. The 1950 Brazil-Uruguay final drew a crowd of 173,850 to the Maracana. The crowd watched a shocking defeat take place, as Uruguay won 2-1 over the hosts. The defeat was so stunning that Thomaz Soares da Silva, or Zizinho, would receive phone calls every year on the day of the loss. “Every 16 July I took my phone off the hook, because otherwise it would not stop ringing,” the Brazilian player explained. 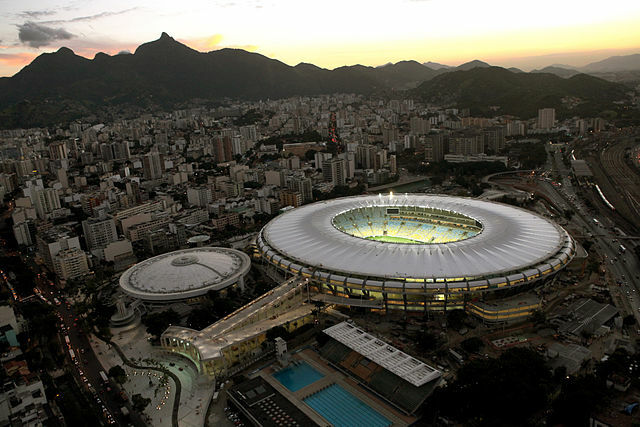 Any shocks seen in the Maracana at this World Cup will be witnessed by fewer people in person. With a capacity of 73,531, the 2014 Maracana is the biggest of the stadiums in Brazil, but still falls short of its previous capacities. The record for youngest player to score a goal belongs to Edson Arantes do Nascimento, more commonly known as Pelé (17 years and 239 days of age.) The oldest player to score a goal is Roger Milla who scored Cameroon’s only goal in their 1994 6-1 defeat at the hands of the Russians. When he scored, Milla was 42 years and 39 days old. Milla, however, is not the oldest player in World Cup history — that honor goes to MacDonald Taylor who played for the U.S. Virgin Islands in February 2004 when he was 46 years old. As for the coaches, Otto Rehhagel, who coached Greece at South Africa 2010, is the oldest — he was 71 years old at the time. The title of youngest belongs to a then-27-year-old Juan José Tramutola. The Argentinian set this record at the 1930 World Cup, coaching a team that included players older than himself. Speaking of Pelé, the Brazilian is also a part of a select World Cup quartet; 56 players have made appearances in two World Cup Finals, but only four can say they scored in both. One, of course, is Pelé — but he isn’t the only Brazilian. Vavá — Edvaldo Izídio Neto, or “Peito de Aço — also has this statistic to his name. Playing for then-country West Germany, Paul Breitner also accomplished this feat and most recently, France’s Zinedine Zidane added his name to the list. Pelé does miss out on another player quartet though — involving hat-tricks. In World Cup history, there have been 48 hat-tricks, but only Sándor Kocsis (Hungary), Just Fontaine (France), Gabriel Batistuta (Argentina), and Gerd Müller (Germany) managed to pull off the hat-trick twice at the World Cup. Out of the four, Batistuta is the only player to score his hat-tricks at two different World Cups. He may not have the double hat-trick to his name, but Pelé remains Brazil’s all time leading scorer. During his 92 international appearances for Brazil, “O Rei” (The King) scored 77 goals. He is also the only player to win three World Cups: 1958, 1962, and 1970. Of those 77, 12 were during World Cups, and you can see five of those goals above. The television data for the World Cup is absolutely staggering when you consider the timeline. The first year it was broadcast was in 1954, then by 1970 satellites were bringing the matches of Mexico City to viewers around the world, and by 2010 every country — including Antarctica — could watch the action unfold. 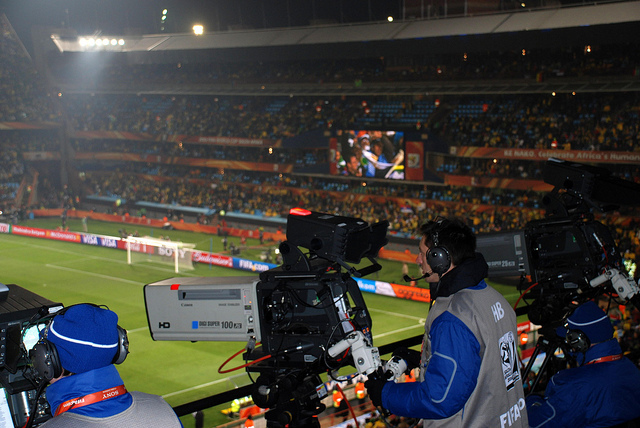 The in-home viewership of the 2010 Cup alone was more than 3.2 billion, meaning that without counting bars, other public venues, and mobile devices, the World Cup reached at least 46.4 per cent of the world’s population. Since the first World Cup in 1930, 76 teams have participated, and in 2014 the count grows to 77 as Bosnia-Herzegovina takes part for the first time. 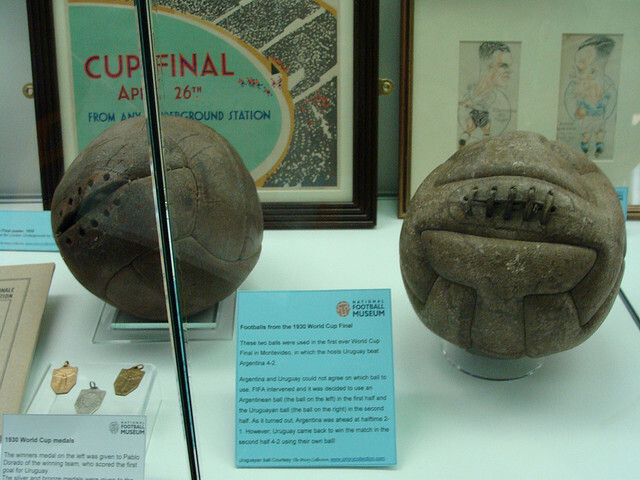 Back at that 1930 World Cup, not only did the balls looked a little different, but fewer teams took part. There were only 13 teams vying for the trophy at that first World Cup, and the following year 16. The leap to 24 teams would not take place until 1982, and the current 32-team format has been in place since 1998. With fewer teams, play progressed faster, with it taking only 17 days and 18 matches to determine the winner — Uruguay. Now, the World Cup is just over one month long, and 64 matches are played before the winner is ultimately crowned.